Moriah Hellstrom, a senior music major from Omaha, plays on the piano in Paul Barnes' studio in Westbrook Music Building. A May graduate, one of Hellstrom's final Nebraska experiences will be learning from world-renowned composer Philip Glass. Moriah Hellstrom was drawn to Nebraska by the opportunity to study with pianist Paul Barnes. Four years later, as the senior music major prepares for graduation, Hellstrom’s decision to become a Husker will play out in a finale that includes world-renowned composer Philip Glass. In the days leading up to the performance, Nebraska music students and faculty will get the unique opportunity to interact with Glass, watch him work with Barnes and the Chiara String Quartet, and experience firsthand how the famed composer prepares for a recital. The daughter of two music majors who met while playing in the University of Michigan marching band, Hellstrom has been immersed in music her entire life. She started playing piano at age 11 and has studied with Kenneth Drake, a University of Illinois emeritus professor and Ludwig van Beethoven expert; James Johnson, professor emeritus at the University of Nebraska at Omaha; and now Barnes, Marguerite Scribante Professor of Piano and an expert on the music of Franz Liszt and Glass. While at Nebraska, Hellstrom has performed in Italy at the Amalfi Coast Music and Arts Festival; played on a Victor Borge piano for the Borge family; started a solo piano career; played as part of the Spiazzo Piano Trio; and actively developed her own compositions. She also played some of Glass' compositions along the way, primarily Etude Nos. 6 and 16, as a sophomore. "Playing Glass is a wonderful challenge because my hands are not large enough to properly reach the keys," Hellstrom said. "But I do really enjoy his compositions. He creates some really great chord progressions that are hypnotic and easily connect with a lay person, while also interesting to an experienced musician." After graduation, Hellstrom plans to pursue graduate and doctoral degrees in music, focusing on piano and composition. Ultimately, she hopes to teach at the college level, write her own compositions and continue performing — hopefully following a career path similar to Barnes. While excited to be amongst the first to experience “Annunciation” at the Lied Center, Hellstrom is most looking forward to watching Glass as he works with Barnes and Chiara Quartet in practice sessions prior to the recital. 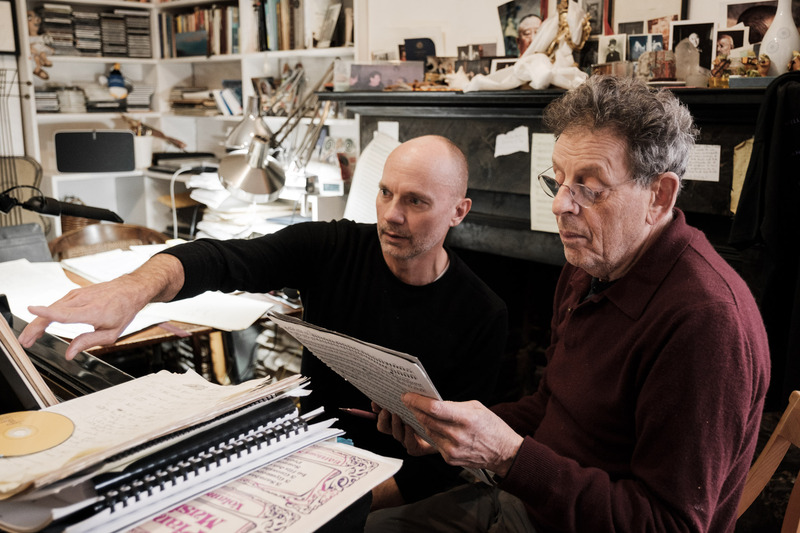 Paul Barnes (left) and Philip Glass review the score for "Annunciation."